Cathy Fisher is Founder and President of Quistem, LLC. With over 30 years of respected expertise in the quality field, Cathy has worked with thousands of organizations from small start-ups to multi-national corporations in a wide range of industry sectors. Cathy helps organizations build their technical talent using customized on-site and on-line learning experiences to support implementation and maintenance of the essential business systems needed to achieve Predictable Success. 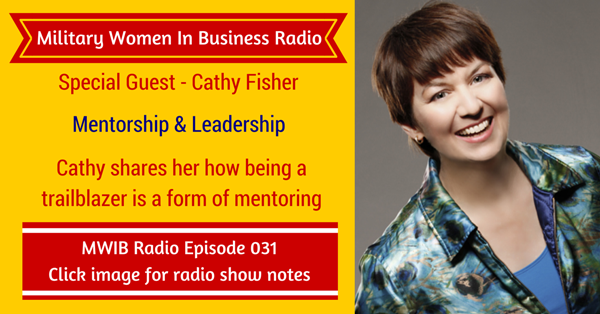 Click to tweet on Twitter: Cathy Fisher shares how being a trailblazer in your industry is a form of mentorship! I love how Cathy is breaking new ground in her industry! One of the ways she’s doing this is working with her clients online vs. working onsite. For Cathy, her clients are used to learning hands-on in a laboratory or in classrooms. Not only is she turning heads for her approach, but she is getting better results! It’s also more convenient and cost-effective for her clients. It’s always a challenge when you’re charging on a new path and you’re doing things differently than they are normally done but you have to be ok with it and forge ahead. Cathy encourages mentorship and to search for a mentor. She mentions that it doesn’t have to be someone who is in the same industry or business as you. A mentor could also be someone who is an expert in a particular aspect of business that you want to get better at. Cathy mentions that one of her best mentors is a sales and marketing expert. And if it wasn’t for her, Cathy wouldn’t be challenging herself to move forward on some of the paths she’s on and bringing her clients with her. The key to finding a mentor is to be open to receiving someone as your mentor and looking outside of your industry. The key to a great mentorship experience is clearly articulating your goals and expectations. The mentor and mentee relationship is all about give and take. The more prepared you are about what you want out of the relationship, the more your mentor will look at they can do to help you. Think about what you want to gain from this relationship with your mentor. A successful mentor relationship involves both parties receiving value on a consistent basis that benefits both the mentor and the mentee. Special thanks to Cathy for joining me this week. Until next time!